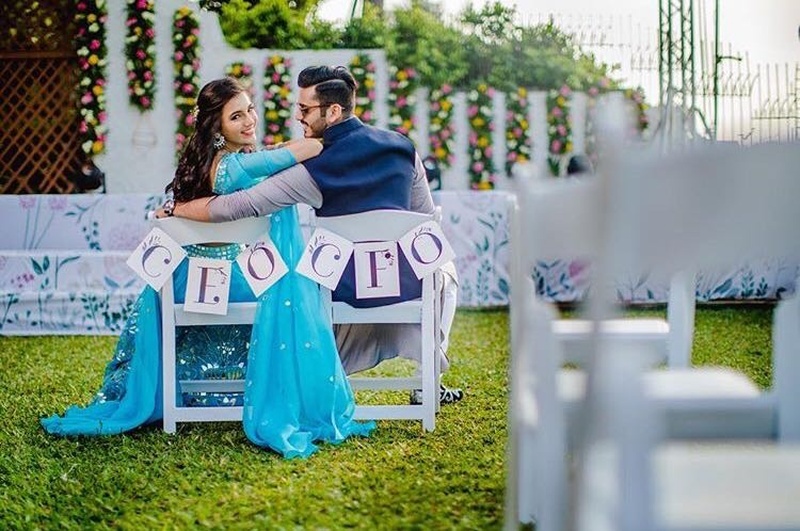 Masoom Minawala recently tied the knot with her beau Shailin and we’re thrilled! For those of you who don’t know who this talented woman is, she is the face and brains behind the blog Style Fiesta. And being so fabulous in the fashion and style space, of course she ensured that every detail of her wedding was bound to be all things gorgeous. For now though, we bring to you the Mehndi series. This stunning Mehndi design had personalised elements from Masoom and Shailin’s love story like The London Eye, where Shailin asked Masoom to be his girlfriend. Her gorgeous blue mehndi lehenga was designed by Abu Jani and Sandeep Khosla, which by default made it fabulous. The Mehndi décor done by Altair blew us away with all of its personalised, creative and pinterest-worthy elements. Masoom wanted the decor for this day to be a compilation of her favourite things with a blend of dreamy, mystical, bohemian elements. The brilliant photography by WeddingNama brought each detail to life. – White Garden Chairs for a relaxed theatre seating during dance performances. – Picnic table-bench seating in a raw-birch finish with a Chantilly lace runner, accessorized with bright florals and a touch of gold. – Ferris wheels as table centre-pieces to represent London Eye (Where Shailin asked Masoom out on a date 5 years ago). – Chip-chop game strewn around the tables with a ‘Would You Rather Game’ inside to represent her love for games, and most importantly, for an impromtu Would You Rather session. – Handpicked Persian carpets with delicate motifs in shades of ivory, maroon and tan, forming an entrance walkway into the venue. – Book & bulb hanging installation to represent her love for reading. – Overflowing script photobooth with their love story inscribed within. – Ivory crochet boho dream catchers as a periphery by the sea encompassed the vibe for the night. – Customized flex on bar with LED heart trio. – CEO/CFO Chairs, cuz #GirlBoss. – Draped entrance aligned with coral trunks and cottage white crates, donned with ornate frames, chrome lanterns and vintage tea cups. – Steps with clusters of glass jars, vases and pots in miscellaneous shapes and sizes, adorning the descending steps with foliage runners, candles and chai pyaalis. – Hand painted song lyrics that symbolize Shailoom over wooden boards – finished with few sprigs of eucalyptus.